In a Dutch oven, sauté onion, celery and carrot in butter until tender. Stir in GF flour until blended. Gradually add milk. Bring to a boil; cook and stir for 2 minutes or until thickened. 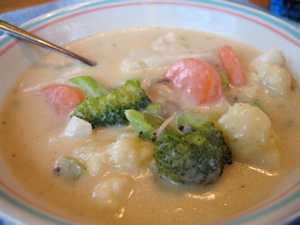 Add soup, cheese, steamed broccoli and cauliflower, and Lawry's; mix well. Cook and stir until cheese is melted and soup is heated through. Yield: 10-12 servings (3 quarts). If you can do lots of dairy - this is a good one. We have not tried subbing out the dairy.